This article is by David Glance, Director of Innovation, Faculty of Arts, Director of Centre for Software Practice at University of Western Australia. It originally appeared on The Conversation. analysis Visions of a cashless society started being portrayed from the 1950’s along with other aspects of a future waiting to be transformed by technology. That future has not yet arrived but it is now possible to exist without using cash on a daily basis. In fact, in a survey released this week, 25% of Australians claim not to use cash in a given month. In the US, 50% of Americans carry less than $20 in cash at any time. Although the survey should be treated with a certain degree of scepticism because of the ways the questions were phrased, it has highlighted that there are an increasing number of ways to pay for goods. From a user perspective, traditional cash represents one of the least efficient forms of payment. Consumers have to carry cash around with them and find machines to withdraw the cash without paying fees. Businesses have to have cash floats and have to deposit cash regularly, both of which involves the risk and inconvenience of carrying sometimes large amounts of cash to a local bank branch. Society’s move away from cash has been accelerating since the late 2000’s when contactless payments were introduced for transactions under $100. The convenience and speed of this type of payment has been a boon for cashless payment and the availability of “tap and pay” on mobile phones was set to drive this transition even faster. In Australia, both the Commonwealth Bank and Westpac both offer the ability to use a Samsung mobile phone to use PayPass and PayWave contactless payments. The Commonwealth Bank also offers the ability to stick a “tag” on other phones not equipped with near field communication (NFC) capability but this is the equivalent of using an ordinary card and so doesn’t really count as a mobile payment. In the US and other countries, Google and other companies provide NFC-based payment using mobile phones. The PayPal mobile app allows people to pay in a store that accepts it. In this case, the payment is made on the phone and the display is shown as proof of payment. Apple provides a similar facility using its Apple Store app although as a young teenager who was arrested after failing to complete a mobile transaction in an Apple Store can attest, sometimes it is not so easy. Another app that works using NFC is QuickTap that can be used with vending machines from Coca-Cola. A phone is placed on a tag on the machine and automatically deducts the purchase from a prepaid account. The QuickTap account can be topped up using PayPal. Most of the major banks allow mobile phone users to transfer money using their apps. 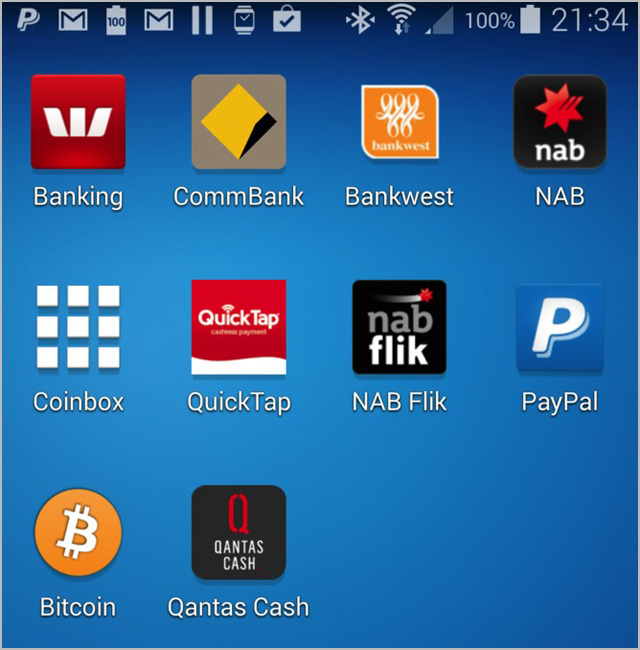 NAB for example has an app called NAB Flik that allows the user to send or receive money from another NAB Flik user by tapping the phones together. Money can also be sent via a barcode or through Facebook or email. If there was ever a currency designed for mobile payment, it was Bitcoin. As a peer-to-peer currency, sending and receiving Bitcoins does not involve a third party and so can go straight from the consumer to the business with no fees or intermediaries to deal with. Apps like Coinbox implement a point-of-sale functionality for Bitcoin that makes the process of accepting Bitcoin as a merchant relatively easy. The main enabler behind all of these forms of payment is going to be how quickly businesses adapt to offering payments using these technologies. The most promising of these, NFC-based payments is currently hamstrung by the implementations being limited to the Samsung phone and by Apple’s refusal so far to support NFC in its phones. The adoption of mobile transactions is also going to vary markedly from country to country. Australia and New Zealand’s adoption of contactless technology for example is far more extensive than in the US which is likely to lag in mobile payments of this type for some time to come. A cashless future is an inevitability. The passing of the use of paper cheques attests to how forms of transaction change with technology and the demise of cash is something that will surely follow. Vodafone and Visa were working on something but they’ve gone silent for a while now about it. It was something about a special sim and a prepaid card, to be used with NFC. Completely. 100%. Wrong. Bitcoin transaction are instant, sure, for varying definitions of instant. But verifications to ensure that these payments actually took place take much, much longer. In fact, the network adjusts itself to do a verification in, on average, 10 minutes always. The only way to you do a mobile payment and have a party ensured is to do some other double-spend detection (possibly in special cooperation with mining pools), which is much more easily thwarted than the blocks or, much easier, to go through a third party. Like Coinbase. If you think differently, I’m happy to spend some Bitcoins right in front of you and let them arrive in your wallet as pending while you hand over the goods or services for me to disappear. This is also incorrect. I have a Nexus 4 – they do NFC, but Commonwealth wants me to pay for a tag anyway. Which is why I haven’t bothered and just use the free credit and debit cards while waiting for Google Wallet to come along. Apparently Commonwealth doesn’t have the secret keys required, only on the Galaxy S4 (we also have an S3, with NFC, but no Commbank support on NFC). > In fact, the network adjusts itself to do a verification in, on average, 10 minutes always. And quite a few places actually require more than one confirmation, but that’s an aside. And, most importantly, can you please not link to random services like this thing, which apparently nobody uses? There is an intermediary, otherwise the transfers wouldn’t be “instant”. If you’re going to link to a Bitcoin service at least do so to a big and established one, one that’ll at least be important enough to make financial news if they do a runner and/or shut down under suspicious circumstances – like the very much alive and pretty awesome Coinbase or the now gone and under suspicious circumstances too Mt. Gox. There is no credibility behind this (or even this kind of) service (especially since they claim to do instant transfers even from sources outside their – what should I call it – stash), and they do not deserve to be linked to unless you want to take some minor responsibility for their almost inevitable shut down before too long in which people will lose money. But I guess they do have a near full-screen picture above the fold and cutesy pictograms below, if nothing else. And apparently are based in Ottawa with the only remotely useful contact detail being a San Diego phone number. That’s not even the same country. Good luck with that though. A cashless society encourages bartering as well, to “beat the system”. If we have an over-reliance on digital currency, we assume everything is digital and dont dig as deep as we perhaps should. So the smart businessman and customer work outside the digital world, for mutual benefit. Same mentality as cash in hand jobs, there would be no record of the transaction, making it hard to track down and treat accordingly. Having said that, if you formalise the barter system, like what was tried with Bartercard 15-20 years ago, then it makes it somewhat trackable. A method that was ahead of its time, perhaps?